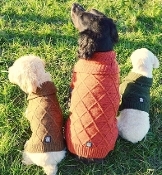 Keep your best friend warm and strutting in style with one of these adorable tweed Cable Knit Dog Sweaters. This Tweed Cable Knit Sweater has a wide fold over collar, which helps provide protection against the elements and makes an amazing fashion statement. The underside of these cable knit sweaters feature a square European cut, allowing for a smoother fit on the belly with less bulk near the hind legs. Made from 100% acrylic knit, these adorable dog sweaters are truly a fashionable and cozy fit. Vertical ribbed hem adds style to the neck and waste. The always adorable Petrageous swirl paw design sits on the lower back of the sweater. Available in Brown, Green or Rust. Available in extra small, small, medium, large or extra large.